The National Weather Service has issued tornado watch warnings for parts of Maryland, New York, Pennsylvania and West Virginia. Sunday’s warnings come as a severe storm in the South destroyed homes, hospitalized people and caused the deaths of eight people. In neighboring Houston County, the sheriff’s office has confirmed one person was killed in Weches, some 6 miles (10 kilometers) southwest of Caddo Mound. The 38-member entourage from the Horry (OH’-ree) County School of Music, along with 17 chaperones, left Charleston, South Carolina, on Saturday for Dallas-Fort Worth, but storms forced their flight to divert to Little Rock, Arkansas. Tour leader Amanda O’Brien said that after some confusion, American Airlines representatives were able to get them on their way to Beijing late Sunday morning. Airline spokesman Ross Feinstein said the addition of hail to Saturday’s storms and the resulting need to inspect aircraft for resulting damage forced cancellation of 350 flights from DFW Saturday. In Louisiana, Deputy Glenn Springfield of the Ouachita Parish Sheriff’s Department said Sunday that two people died in floodwaters Saturday. A county employee in Alabama died after being struck by a vehicle while he was helping clear away trees toppled by the storm. Capt. David Agee of the Jefferson County Sheriff’s Office says the worker was struck about 2:15 a.m. Sunday near in the Birmingham suburb of Hueytown and died after being taken to a hospital. His name was not immediately released. Damage to the town’s schools has prompted the Alto Independent School District has canceled all classes until its buildings have been found to be safe. Monroe County Coroner Alan Gurley says 95-year-old Roy Ratliff died late Saturday when a tornado toppled a tree onto Ratliff’s home in the town of Hamilton. 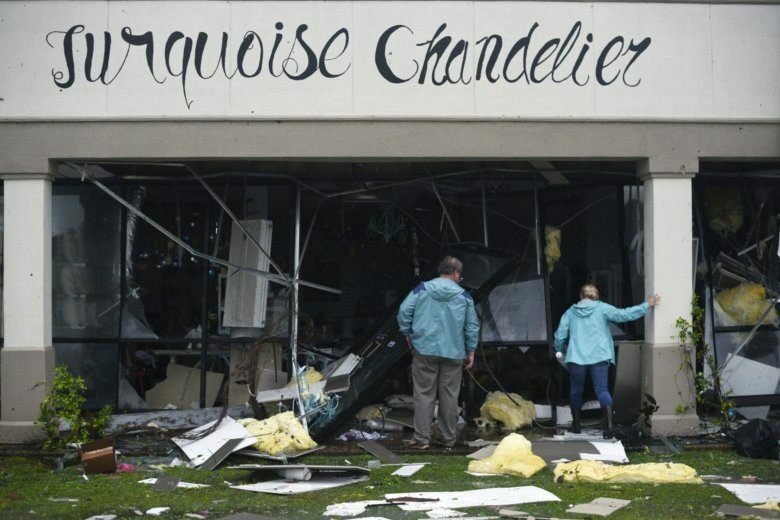 The Northeast Mississippi Daily Journal reports that a hospital clinic, some apartments, several storage units, a mechanic’s shop and the Hamilton Volunteer Fire Department all had major damage from the tornado. The National Weather Service detected a possible twister on radar, but it’s unclear whether a tornado or straight-line winds caused the damage. The Storm Prediction Center says trees and power lines are down in Brewton near the Florida line, and some power is out. Homes were damaged about 250 miles (402 kilometers) to the north in Glencoe, and there’s scattered damage south of Birmingham. In East Texas, authorities say two children were killed when high winds toppled a tree onto the back of the family car while it was in motion. The Angelina County Sheriff’s Office says an 8-year-old and 3-year-old died after the tree hit the back of the car in Lufkin, about 115 miles (185 kilometers) northeast of Houston. The parents in the front seats were not hurt.